From single to multiple pocket options high quality clear plastic pages are sealed together and preserved with or without a front and back cover. 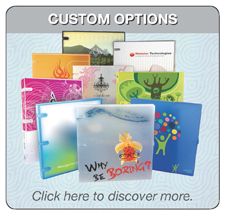 If you chose to include a cover we have multiple choice options of material that will give you the look and feel your desire. 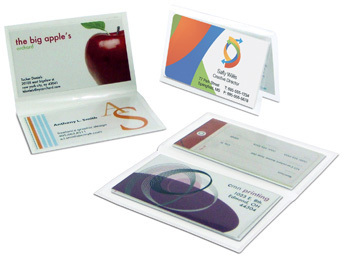 The card wallets are typically used for business cards, credit cards, gift cards, business and personal documents, even photos. Contents are easy to remove and exchange. Add a logo or brand design to the cover for an added benefit. Great for events such as trade shows, conventions, promotional and networking occasions. 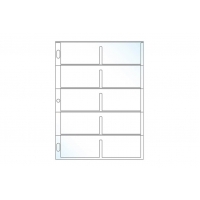 Easily personalize these high quality crystal clear card holders with information by simply inserting your information cards into the cover pockets. All our pockets have exceptional clarity that allows you to see exactly what’s inside the product. Efficiency, durability, and value add are easy to recognize in all our products. As low as $0.17 per sheet! Business card page is made from 100% recyclable polypropylene and fits all standard three ring binders. As low as $0.219 per sheet! As low as $0.041 per sheet! Single adhesive-backed business card pocket. As low as $0.065 per holder! 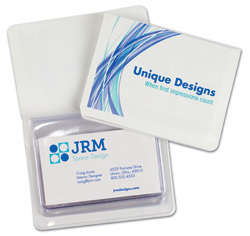 EnvyPak's Clear Business Card Sleeves hold multiple business cards, sized 3.5" x 2", in two small pockets.